Jøtul's medium-sized single door, non catalytic woodstove just got better, with enhanced fire viewing and air wash performance. 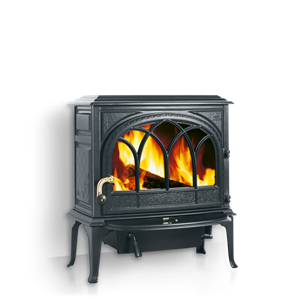 Featuring meticulous craftsmanship and design, the Jøtul F 400 Castine will provide a warm, wonderful centerpiece for your hearth and home. Created by the award winning team of Red House Design and our in-house design engineers, this stove has a unique nautical theme which highlights the tradition of seacoast living, a lifestyle shared by residents of Maine and Norway. Popular options include: screen for open door fire viewing, leg leveler kit, short leg kit for installation into an existing fireplace, mobile home approved leg bracket kit, outside air adapter, rear heat shield, and a choice of three enamel colors or Classic Matte Black Paint.